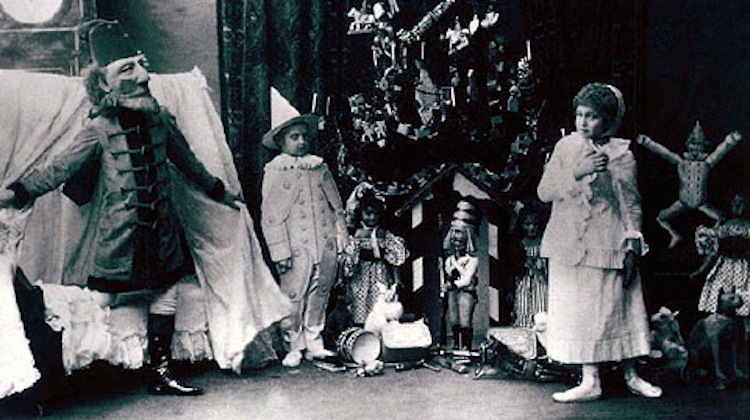 Catherine Hokin investigates the history of festive favourite, The Nutcracker ballet. A deeply creepy inventor ‘uncle’, a seven-headed mouse, a little girl who tears her arm open on broken glass and a curse which traps first a queen and then a boy inside the misshapen body of a giant nutcracker: what better story to entertain your little ones this Christmas? For the next few weeks theatre foyers will mill with children stickily clutching wands and toy soldiers, waiting to be inducted into the wonderful Christmas world of The Nutcracker, a ballet with far darker origins than their sugar plum fairy and sweetie-filled heads can possibly imagine. The Nutcracker was first performed on the 18th December 1892 at the Imperial Mariinsky Theatre in St Petersburg (pictured above), set to music by Tchaikovsky who had enjoyed great success with Sleeping Beauty two years earlier. The book for this ballet was not, however, the original story. ETA Hoffman’s 1816 The Nutcracker and the Mouse King, with its oppressive and cruel parents, evil curse-ridden rodents and terrified runaway children who never return home, may have influenced Edgar Allen Poe but it was hardly family-friendly. The work which continues to form the basis of the ballet was the 1844 adaptation, Histoire d’une Casse-Noisette, by Alexandre Dumas. 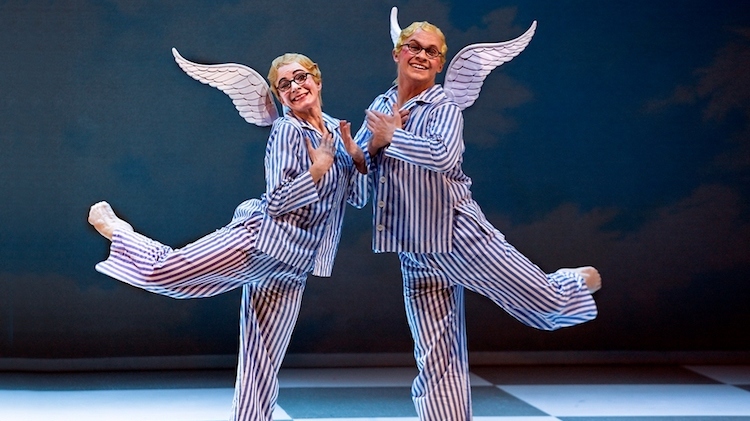 In this version the central child rejects their dream world and wakes up happy and smiling under the Christmas tree – a Hollywood-style ending which was largely the reason for the ballet’s future success. And its success was very much in the future. In 1892, Russian critics called the choreography confusing, the libretto lopsided and the whole experience (according to the St Petersburg Gazette) “the most tedious thing I have ever seen.” After the first Russian Revolution in 1905, the ballet was dropped from the repertoire and, in a twist Hoffman may have appreciated, its principal male lead, Sergei Legat, slit his throat. As many of the Mariinsky dancers scattered across Europe in the early twentieth century, the ballet re-appeared, first in Budapest in 1927 and then in London in 1934. It took an American showman, however, to bring The Nutcracker fully back into the light. In 1940, Walt Disney used the entire Tchaikovsky score in Fantasia, bringing the music to a huge and appreciative audience. On Christmas Eve 1944 the San Francisco Ballet performed the first complete version of the ballet and in 1954 George Balanchine’s New York production turned the ballet into the classic Land of Snow and Kingdom of Sweets version we recognise today. Where America went, the rest of the world followed: more companies have performed The Nutcracker than any other ballet. 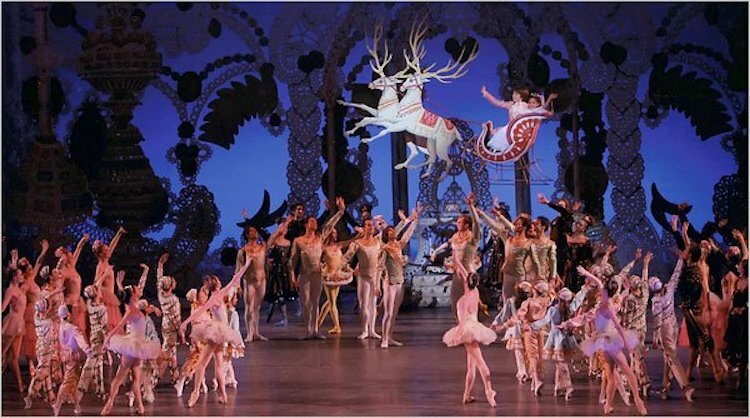 In 2015 the Royal Ballet December production was beamed live to 2000 cinemas and, according to Daniel J Wakin of the New York Times, its holiday run “is generally the foundation of an American dance company” – little surprise that The Nutcracker has become as much a festive staple as mince or pumpkin pies. Why has The Nutcracker become so popular that even non-ballet fans, who would run a mile at a suggestion of an evening with Les Sylphides, are happy to be dragged along? Perhaps because it truly is family-friendly, with parts for over 35 children, its pattern of short, highly-charged dances and its watered-down cute mice and dancing toys. Perhaps because, in the words of Isabel McMeekan, founder of Everyday Ballet and a former dancer, “It’s the eternal fantasy of Christmas come to life on stage…the girl, the guy, the dream, the magic tree that grows to 7 feet, the glittery snowflakes.” Or perhaps because it has proved so adaptable. As well as traditional outings there have been hip-hop, LGBT and Jewish versions and, my own personal favourite, Matthew Bourne’s Dickensian orphanage with its pyjama-clad cupids and cast of very wicked sweets (check out the exceedingly sticky Knickerbocker Glory). And in that, I think, lies the ballet’s endurance – to paraphrase one supermarket’s ad this year: however you do Christmas, there’s a Nutcracker for you. Catherine Hokin‘s debut novel, Blood and Roses, brings a new perspective to the story of Margaret of Anjou and her pivotal role in the Wars of the Roses. Catherine also writes short stories – her latest (a dark twist on Mary Poppins) will be published by Writers’ Forum magazine in January – and blogs monthly for The History Girls.